I picked up a hitchhiker the other day on a rural highway when it was -17C bitter cold. Believe it or not it was a huge St. Bernard dog. My sis and I were driving my daughter to her job and I'm going my usual under the max speed limit and then I spot an animal way up ahead and I say out load "What the hell is that?" "It's a dog". So the dog sees my car and begins the criss cross the highway and I notice that its saliva is hanging frozen from its mouth. So I just pull the car over on the shoulder and asked my sis to get out open the back seat door and call it...which she did...and the dog came a running and jumped in the car. So we looked up where the SPCA was and headed there. I must say this dog was huge, well mannered and friendly, except for being too interested in my sis' fur hat he allowed us to look at his tag. So my daughter called the owner and left a voicemail. So we get to the SPCA and they tell us they don't take strays and then she called the dog pound. The pound lady showed up within 10 minutes and took the dog to the pound. I called the pound this morning and they told me the owner picked the dog up that same night. If my daughter ever sends me his/her pic, I'll post it later. He/she was mostly black with a little white and beautiful gold eyes. We believe the owner tried to call 3X that same evening, but we were too busy to answer it. 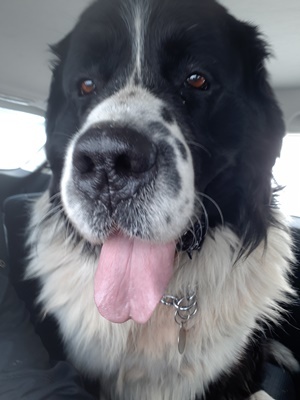 (02-02-2019, 12:47 AM)UniqueStranger Wrote: Believe it or not it was a huge St. Bernard dog. My sis and I were driving my daughter to her job and I'm going my usual under the max speed limit and then I spot an animal way up ahead and I say out load "What the hell is that?" "It's a dog". So the dog sees my car and begins the criss cross the highway and I notice that its saliva is hanging frozen from its mouth. So I just pull the car over on the shoulder and asked my sis to get out open the back seat door and call it...which she did...and the dog came a running and jumped in the car. Good for you, I love St. Bernard's … Enjoyed reading your post! That kitty is having a hard time disengaging! It was a wonderful thing you did, US. At -17 a dog's paws will get cold fast even if it has a lot of fur. (02-02-2019, 05:49 PM)Octo Wrote: It was a wonderful thing you did, US. At -17 a dog's paws will get cold fast even if it has a lot of fur. I know, my high school gal pal dog lover told me that if you are cold, they are cold too. Is it time for some Three Dog Night? The owner phoned my daughter and asked her to not pick up his dog next time he is running on the highway. She did not get into it with him, but I would have. Sure, I'll leave your dog running back and forth on a highway while his paws are most likely freezing. I guess he was angry because he had to pay a fine which takes priority over the dog's welfare. Bless you for doing that! He looks like a big sweetie! and gives them Fleas . he ain't no innocent dude I tell ya , check your Wallet Man . Wait, he did seem a little too interested in my sis' mink hat. (02-06-2019, 06:12 PM)JayRodney Wrote: Bless you for doing that! He looks like a big sweetie! Thanks for saying so, now the question remains what do I do if I see him running amok on the highway again when the owner told me to leave him be.